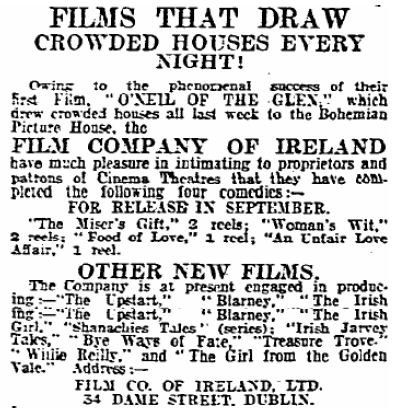 The growth of picture houses in the 1910s provided Irish people with unprecedented visual access to the world. The increasing number of cinemagoers could view otherwise difficult or impossible to see geographical spaces, the geopolitical spaces of Europe’s battlefields and even the intimate spaces within the human body. Dublin Evening Mail 24 March 1915: 5. “You can take a series of X-Ray pictures at intervals of a few minutes each, while the stomach is busy digesting food,” observed an article in the Dublin Evening Mail in late March 1915. Designed to look like a news item, this article was actually an advertisement for Bisturated Magnesia, a treatment for excess stomach acid. It used the term “moving pictures” – capitalized like no other word in the body of the article – to attract the roving eye of newspaper readers (and film historians), dyspeptic or not. Some advertisers clearly saw moving pictures as a desirable technology with which to associate their product in this way, as the promoters of White’s Fruit Jelly Crystals had done in the same newspaper in August 1913 (“Really Moving Picture”). In their use of stomach X-rays, the advertisers of Bisturated Magnesia were, however, undoubtedly making a specific reference to Dr John MacIntyre’s experiments in what is now called medical imaging and specifically to Dr John MacIntyre’s X-Ray Film (1896, 1909), which includes early cineradiography of the stomach. Despite being a medical doctor and pioneer of radiography, MacIntyre could also see that X-rays were a spectacular visual technology, of interest far beyond the medical community (Cartwright 22). As such, he had something in common with the showmen who in the late 1890s exploited the entertainment possibilities of X-rays in theatres and fairgrounds, including in Ireland (Condon). This occurred at precisely the same time as the first projected moving pictures were being exhibited. Unlike moving pictures, however, the entertainment career of X-rays was short. For a start, the danger of radiation burns from prolonged exposure to the rays soon became obvious. As well as this, once audiences had seen the bones of their hands or the contents of a locked wooden box, the novelty value of X-rays was exhausted, but they retained a strong imaginative fascination. By contrast, moving pictures were inexhaustible in the potential subjects they could show, from X-ray images of such interior spaces to the exterior spaces of the historical world and the imagined spaces of fiction. 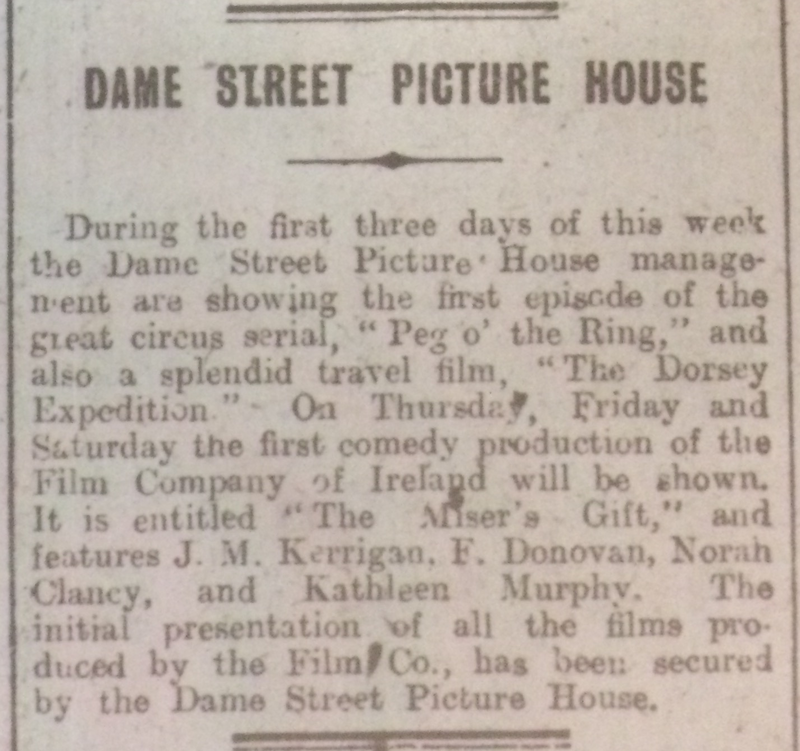 Moving pictures has also prompted the creation of the new social spaces of the picture houses, which were becoming increasingly ubiquitous on the Irish streetscape in April 1915. 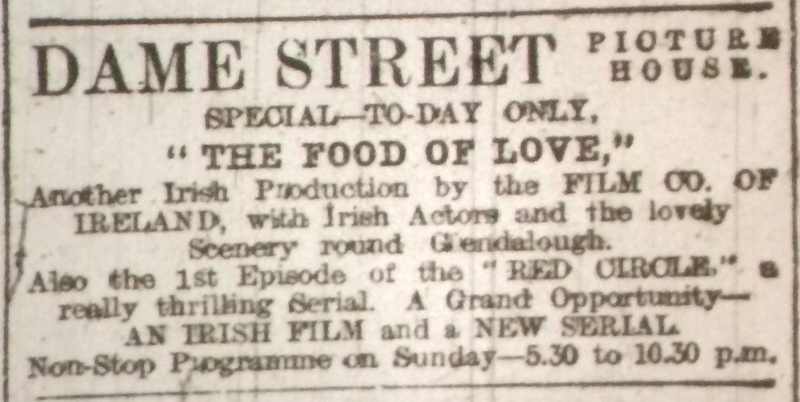 Although the Grand in Lurgan, Co. Armagh, had opened in autumn 1914, it garnered attention beyond local audiences when it was reviewed in glowing terms by the Bioscope’s “Jottings from Ulster” columnist on 1 April 1915. “Situate on the main street and approached through a spacious and ornate foyer,” the Grand held about 1,000 patrons who were stratified by their ability to pay 3d., 6d. or 1s. This was not, then, a utopian space of horizontal social relations. Although a stepped floor ensured that all patrons had a good view of the screen, “the patrons of the highest priced seats are comfortably and exclusively catered for in a handsome balcony abreast of the operating chamber, nest-o’spring seats and deep framed backs being provided in this section” (“Jottings,” 1 Apr.). 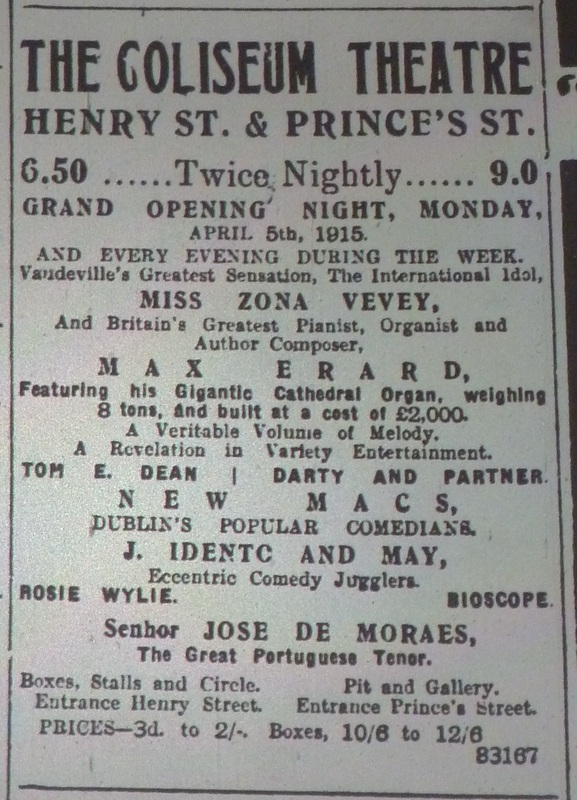 Jottings favoured a programme that combined films with live acts, expressing strong approval of the fact that H. G. Austin, who managed the Grand for proprietor Sam Hewitt, had introduced varieties acts into the programme. As a result of this combination of entertainments, Jottings concluded: “I would not be surprised to find the magnificent tapestry with which the walls are decorated, being removed to make room for the appreciative crowds.” However, like other Irish towns with a similar population (12,553), Lurgan had more than one picture house. At the longer-established Picture House in Carnegie Street, manager Clarke embodied Jotting’s favoured combination of variety and cinema, having been part of the variety duo Clarke and Clare (“Jotings,” 22 Apr.). Evening Telegraph 3 Apr. 1915: 1. 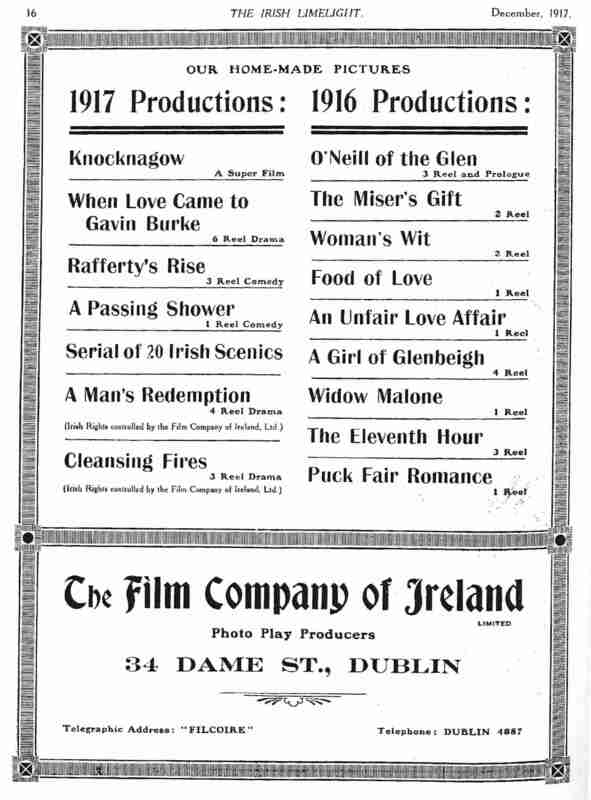 If the Lurgan Grand was in many ways typical of the picture houses opening in mid-sized Irish towns at this time, Dublin’s Coliseum Theatre, which opened on Easter Monday, 5 April 1915, was exceptional. With a seating capacity of 3,000, it was Ireland biggest entertainment venue, and its stage was “one of the largest in the kingdom, being not less than 80 ft. wide and 40 ft. deep, capable of staging the largest spectacular scenes” ([Editorial Item]). In its initial stage of development, the Coliseum had been planned as a large picture house called the Premier Picture Palace, but its promoters had decided that another Dublin variety theatre would be more lucrative than a cinema. Nevertheless, given that film projection had become a stable part of variety programmes, a projection booth had been incorporated into the plans for the building and not as an unsightly supplementary structure within the auditorium, as was the case in older theatres. Praising the features of the Coliseum in advance of its opening, the Evening Herald noted that the “biograph chamber is so designed that it will beautify not mar the general scheme” (“Dublin’s New Theatre”). Despite a general acknowledgment of the quality of the construction and the beauty of the finished theatre, controversy dogged both the building and the opening of the Coliseum. As noted in an earlier post, although other Dublin theatre owners had objected at an August 1914 hearing to the granting of a patent to this new venue, architect, diarist and theatregoer Joseph Holloway had spoken in favour of the new theatre because it offered the prospect of more drama in the city. The most immediate drama came offstage, from such craftspeople as local fibrous-plaster companies and furniture makers who were denied contracts for work in favour of cheaper British firms. In Dublin, the support of local industries was not only a way of creating good will among potential theatregoers but also of mollifying nationalist Anglophobia. 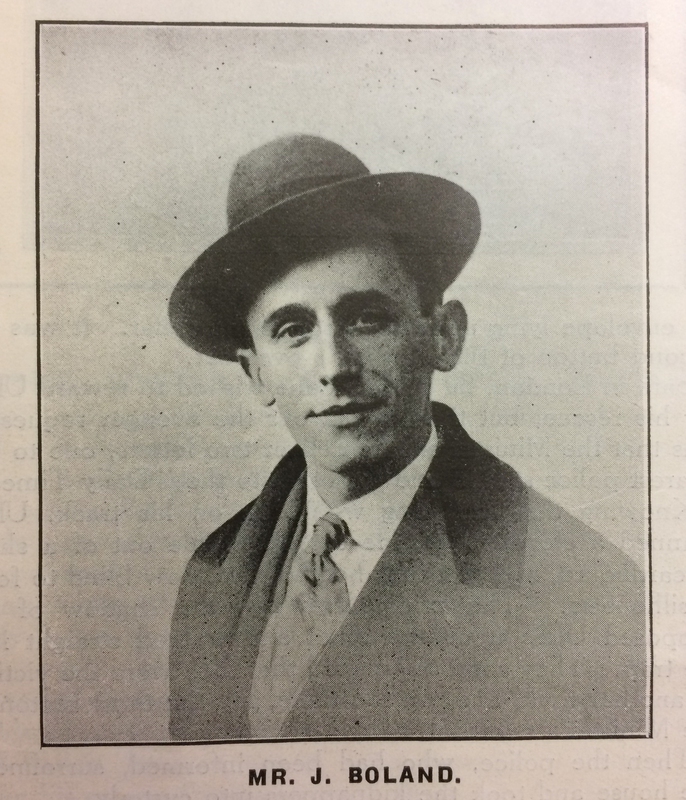 With an ill-tempered public correspondence between the theatre and contractors conducted through the newspapers, the negative publicity for the theatre continued over months, causing Holloway to change his mind about its promise and “wish the new theatre a speedy failure under the circumstances. There is no hope ahead for us poor playgoers in Dublin!” (Holloway, 17 Mar. 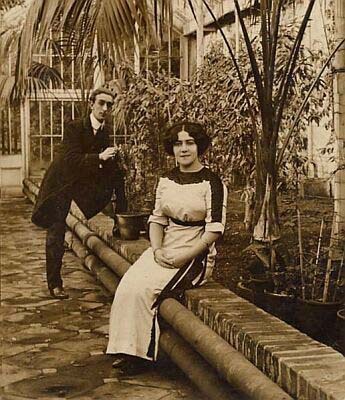 1915). 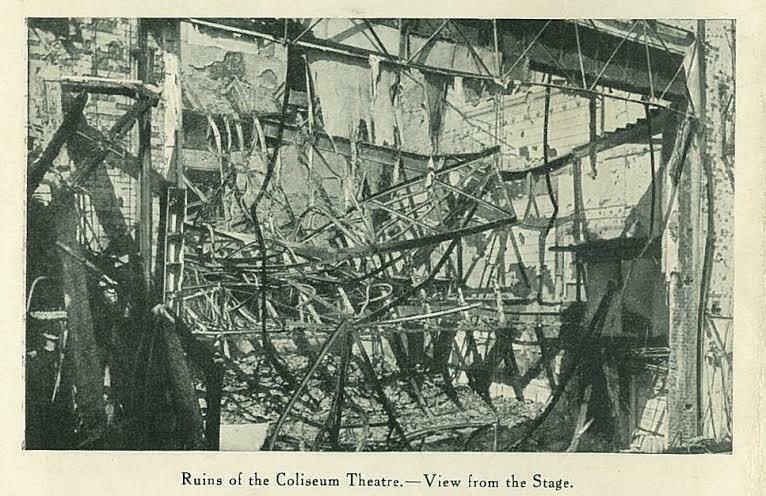 Despite Holloway’s misgivings, the Coliseum’s opening was widely reported a success, and its advent tipped the balance of entertainment seats in Dublin city centre firmly back from picture house to theatre. 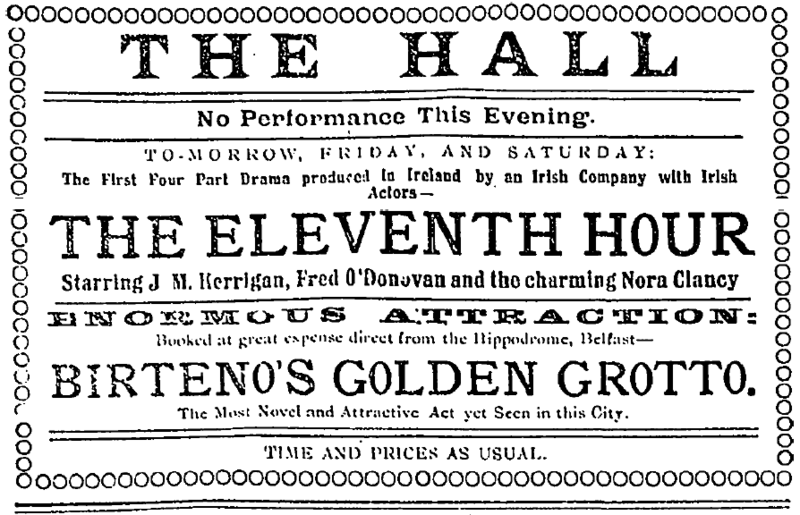 The Evening Herald’s Man About Town was disappointed by the hackneyed nature of some of the opening acts, but he also saw a packed house that included “a few eminent K.C.’s, a land commissioner, several leading medicos, an Abbey Theatre author of distinction, and a trustee of the same concern.” For the Evening Telegraph, among the reasons that the Coliseum “opened its career auspiciously” was that it enjoyed an “advantageously central position […] adjoining the General Post Office and at the tram terminus for all parts of the city and suburbs” (“Coliseum Theatre”). Those same trams might bring pleasure seekers away from the city centre and to the increasing number of picture houses in the suburbs. The arrival of the picture house had reconfigured entertainment space in the city. Some of the suburban picture houses courted more middle-class patrons in search of higher standard of entertainment in the guise of exclusive films, comfortable surroundings and musical offerings. The Bohemian Picture Theatre in Phibsboro – an area on the northern edge of the city well served by two tramlines – was building its reputation as a venue that provided enhanced musical accompaniment. The Bioscope’s Paddy observed that “one of the finest orchestras to be found in any picture outside London – or in London for the matter of that – is that now installed in the Bohemian.” The Bohemian had twelve musicians “and every instrument seems to have been pressed into use, thus affording a musical feast absolutely unapproached by any other house in Ireland” (Paddy, 25 Mar.). Cinemas also competed for audience by offering more luxurious furnishings. Dublin’s Pillar Picture House had “an immense mirror […] beautifully set in a gilded frame[…] Thick luxurious carpets are on the stairs leading to the balcony, and the general appearance of the entrance leads one to imagine that a fairy palace of some sort was about to be entered” (Paddy, 4 Mar.). Some picture houses offered early evening patrons free tea. 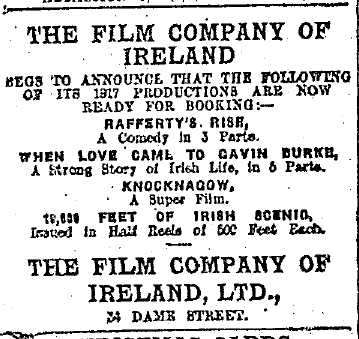 “A big feature is now being made of glow-lamp teas at Kinema House, Belfast,” noted Jottings. “Dainty tables with shaded lights are arranged in full view of the screen, and considerable advantage is being taken of the innovation by those who sacrifice their siestas to the pictures in the afternoons” (Jottings, 1 Apr.). This kind of offering seemed to have been designed to appeal largely to middle-class women who had the leisure to visit the picture houses while shopping in cities and towns in the afternoons. Some religious groups and magistrates saw cinemagoing as an activity to be restricted rather than encouraged among the middle class. One of the main ways in which they sought to do this was through restrictions or a ban on Sunday opening. The ongoing controversy on Sunday opening came to something of a head at the end of March, when the Recorder of Dublin heard applications for music-and-dancing licences for picture houses. The Recorder reiterated his view that Sunday opening should be restricted to working-class areas of the city, where people had little opportunity to attend entertainments during the week. He therefore granted just a six-day music licence to Jacob Elliman’s Blackrock Picture House because it was located in “a residential place, with a very small number of working people” (“Picture Theatres”). 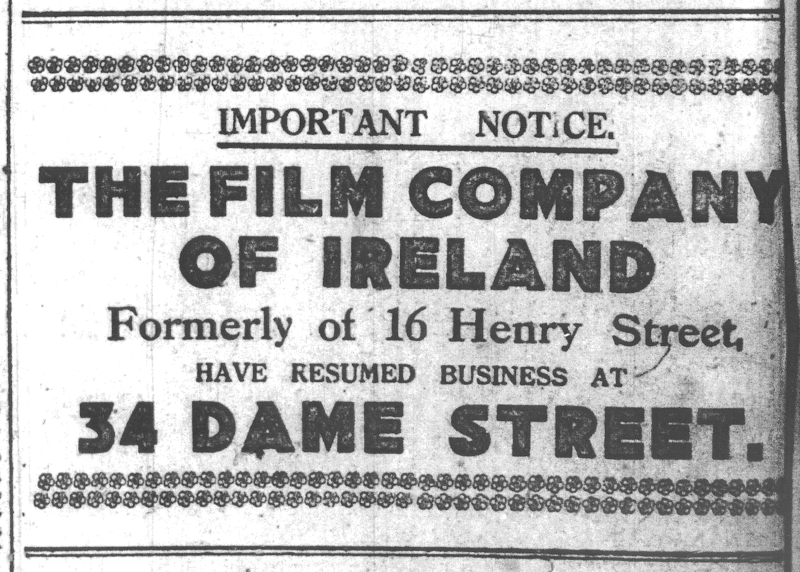 And he again refused a Sunday licence to the Dame Street Picture House, which, he argued, was not frequented by working-class people because it was located on a city-centre shopping street similar to Grafton Street and Sackville/O’Connell Street. 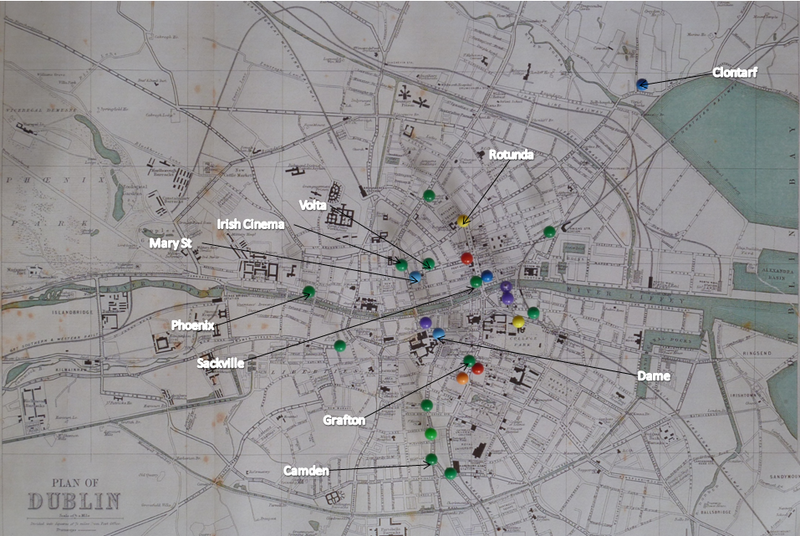 These cases reveal a curious class, sectarian and even acoustic geography of the city that emerged in relation to its picture houses. Cartwright, Lisa. Screening the Body: Tracing Medicine’s Visual Culture. Minneapolis: U Minnesota P, 1995. “Coliseum Theatre: The Opening on Monday.” Evening Telegraph 3 Apr. 1915: 4. Condon, Denis. “‘Spleen of a Cabinet Minister at Work’: Exhibiting X-Rays and the Cinematograph in Ireland, 1896.” Film History and National Cinema: Studies in Irish Film 2. Ed. John Hill and Kevin Rockett. Four Courts Press: Dublin, 2005. “Dublin’s New Theatre: The Opening of the Coliseum on Monday.” Evening Herald 2 Apr. 1915: 5. “Jottings from Ulster.” Bioscope 1 Apr. 1915: 33; 15 Apr. 1915: 260. The Man About Town. “Things Seen and Heard.” Evening Herald 6 Apr. 1915: 4. 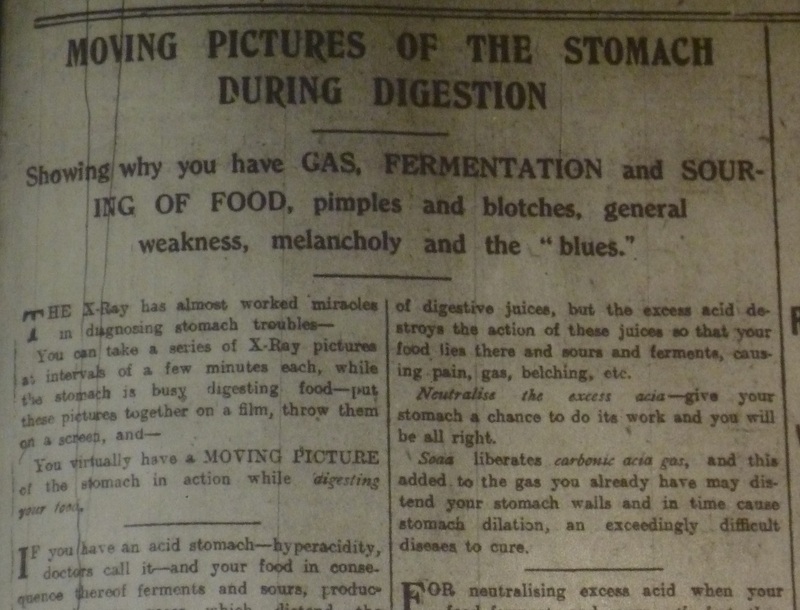 “Moving Pictures of the Stomach During Digestion.” Dublin Evening Mail 24 Mar. 1915: 5. Paddy. “Pictures in Ireland.” Bioscope 4 Mar. 1915: 824; 18 Mar. 1915: 1051; 25 Mar. 1915: 1111. 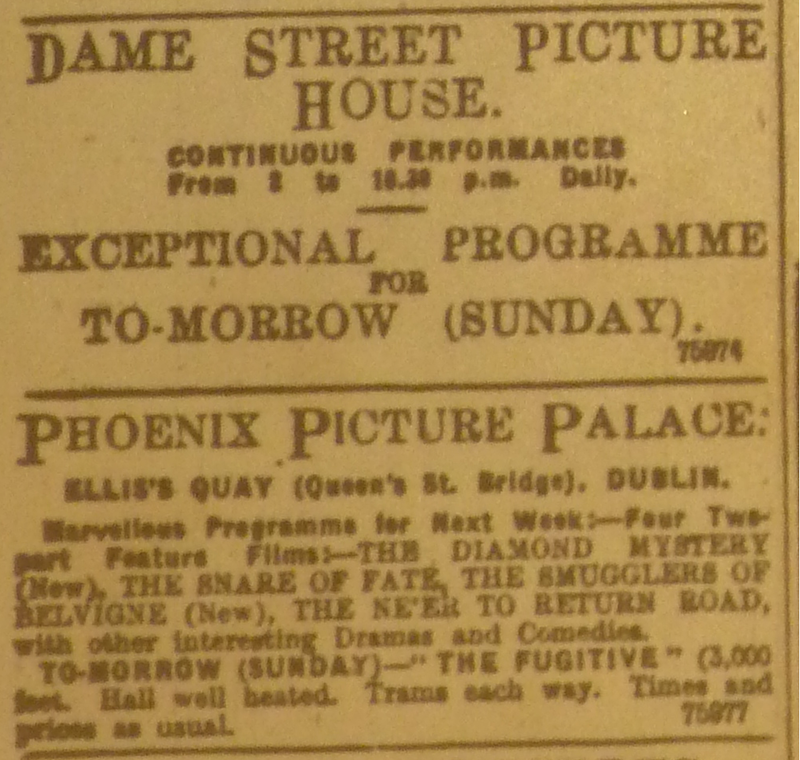 “Picture Theatres: Recorder and Sunday Opening: Many Applications.” Evening Herald 29 Mar. 1915: 5. “A Really Moving Picture.” Dublin Evening Mail 12 Jul. 1913: 3. “Sunday Opening in Dublin: Important Cases.” Bioscope 8 Apr. 1915: 155.